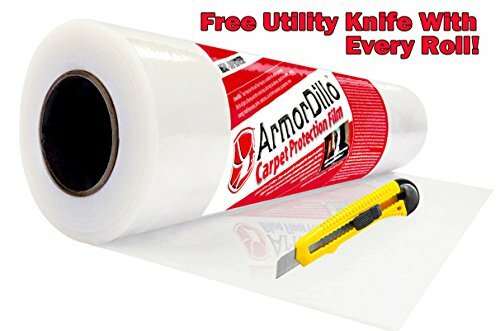 ArmorDillo Heavy Removable Paint Protection Film and Carpet Protector Film is a High-Tack Surface Protection Film and clear protective film used for temporary floor protection and temporary floor covering. Easy to Apply! Easy Clean Up! Repositionable, leaves no residue! Thinner but stronger than 3mil. Linear low 2.2mil construction keeps film light, much easier to use, but stronger than 3mils and most 4 mils on the market today! (Think plate of steel vs plywood). This plastic carpet protector film is durable, and self-adhering. Use this clear adhesive film for all types of synthetic carpeting, and other surfaces that call for high tack with removable adhesive protection such as furniture and upholstery, for carpet protection film and carpet cover, as a clear protective film, multi surface protection film, paint protection film, moving floor protection, protective tape, and temporary floor protection and covering. Ideal for remodeling, painting, moving, model home tours, parties, construction, car and home upholstery pet protection and more. Heavy linear-low construction with removable adhesive. Lasts 45 to 60 days. Easy on and off; designed to leave no residue. High rubber content makes it puncture-resistant. No VOCs. Meets LEEDs requirements. MADE IN THE USA! OTHER USES: paint protection film, protective floor covering, surface protective film, clear paint protection, protective plastic film, carpet protection tape, protective tape, paint protection tape, carpet shield self adhesive film, self adhesive carpet protector, paint protection, adhesive film, polyethylene film, sticky plastic carpet protector, and more. If you have any questions about this product by ArmorDillo, contact us by completing and submitting the form below. If you are looking for a specif part number, please include it with your message.